I can clearly remember being one of the Shyamalan apologists way back in 2006 with Lady in the Water. I was sure people just needed to watch it again in order to get it. So after I myself watched it again, I realized he only thought he was being clever. And over a decade ago I found myself on the side of the majority when The Happening happened. To me it was apparent that Shyamalan lost something, he still had a great visual style, but everything else displayed in The Sixth Sense, Unbreakable, and Signs was diminishing. Then with his step back into the light with The Visit, I was hesitant to hop back on board the train, and the ending (spoilers) for 2016’s Split was simply the level of surprise I thought he all but left behind. So it’s going into his latest film Glass that I hope for the best and expect a follow through to what he started 19 years ago. With the Horde (James MCavoy) on the loose after his 23 personalities allowed the release of the Beast to go on a rampage, hot on his trail is the Overseer whose secret identity David Dunn (Bruce Willis) has embraced his calling. A vigilante hero to the city with the help of his ‘guy in the chair’, his son Joesph (Spencer Treat Clark). But when David encounters the Beast, they are both captured by the police who send them to an insane asylum where they meet Dr. Ellie Staple (Sarah Paulson). She is convinced that these men are delusional much like their star resident Elijah Price (Samuel L. Jackson). As Dr. Staple tries to get to the root of this belief that they are superhuman, Joseph, Elijah’s mother (Charlayne Woodward) and the only person to survive an attack by the Beast, Casey Cooke (Anya- Taylor Joy) try their own methods to reach the hero and villains before drastic steps are taken to rid their minds of these notions of comic book lore being reality. It seems now we should all know what we are getting when it comes to an M. Night Shyamalan film. There is the usual over exposition married with the terrible dialogue. But we also get some impressive visuals and a unique story that in today’s golden age of superhero movies is really quite a thing to see. Shyamalan also made the right move by not making this Bruce Willis’s movie, as he appears to be sleepwalking though the role he played so well so long ago. He allows McAvoy and eventually Jackson to do what they do best, and preform for us in the ways we love to see them. McAvoy releases the remainder of his personalities in rapid sucession with varying degrees of success. I was impressed with the bold nature of the films ending but couldn’t help but wonder if this was a case of too little too late. This may have been always where his original story was headed, it just doesn’t feel fully explored. 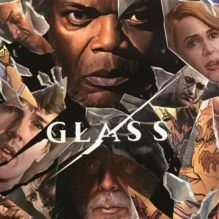 There is a clear effort being made to continue what was started in Unbreakable, unfortunately Glass fails to fall on either end of the superhero movie spectrum. It is a bit too clear cut, and more than a little broken.